Define space in your yard in a fantastic way with the Panacea Lightweight Arched Border Fence. The triple arches on this fence section bring exciting curves to the piece, while a smaller arch underneath each of the larger ones adds interest. Dual horizontal rods near the base of the section support the unit, and the lowest rod extends slightly to an eyelet. This eyelet supports the leg of the next fence section, for a stable border around your plants. The two, 5" long legs insert into soft soil, for use virtually anywhere outdoors. Crafted of metal, this fencing may be used for several seasons, and its black finish meshes with your garden. Protect your plants from foot traffic with this Lightweight Arched Border Fence. 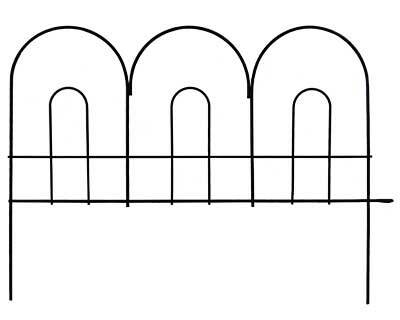 Note: This case pack includes 24 of the Panacea Lightweight Arched Border Fence Sections.